Coconut oil + eggs for moisture and fat – important when working with coconut flour. coconut flour + tapioca flour – makes for a soft, moist cake base very similar to gluten based cakes. I’ve also successfully tested this recipe using almond flour in place of the tapioca flour! 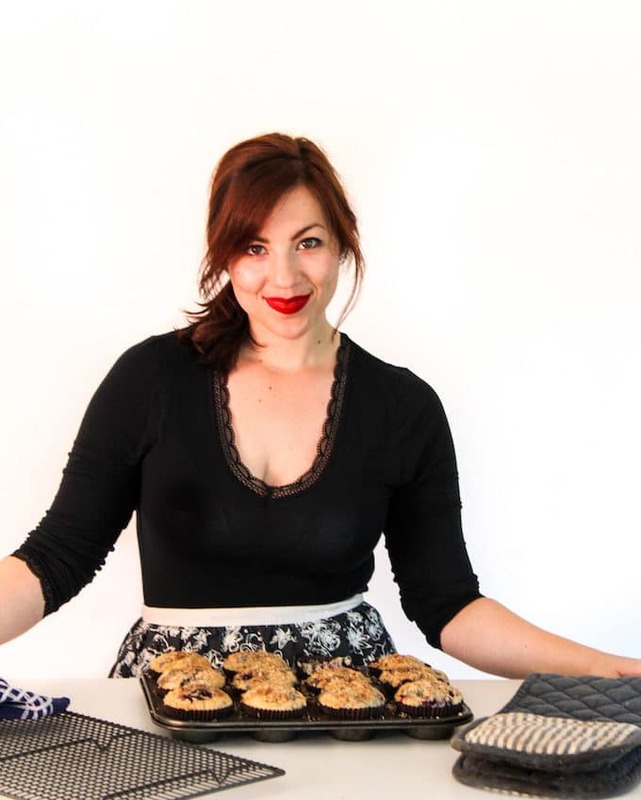 Baking powder for a little rise – more on baking powder down below in relation to paleo baking. 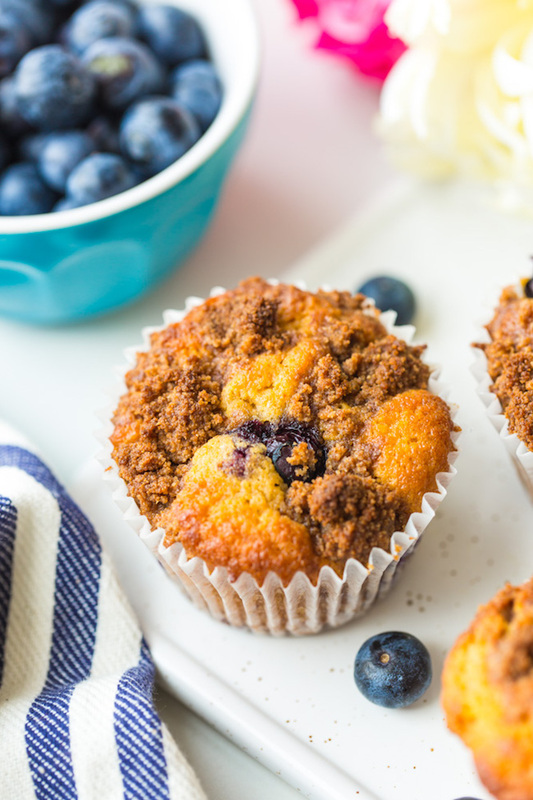 Blueberries – what’s a blueberry muffin without blueberries? Making this cake is really just a matter of mixing together your wet ingredients in a bowl and then stirring in the dry until no lumps remain. 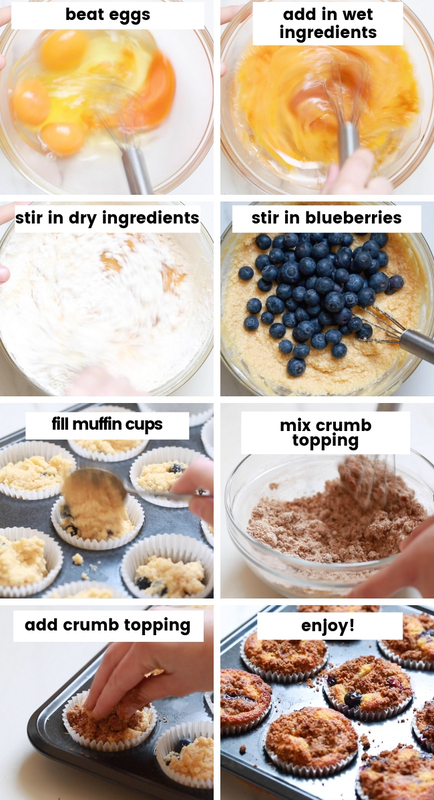 Mix and prepped in one bowl and then spoon the batter into some lined muffin tins while you make the crumb topping. To make your crumb topping, just combine the flours, cinnamon and coconut sugar in a small bowl and whisk to combine. Once the dry ingredients are well whisked stir in your melted coconut until a course, sandy mixture forms. Can I make these egg free/vegan? 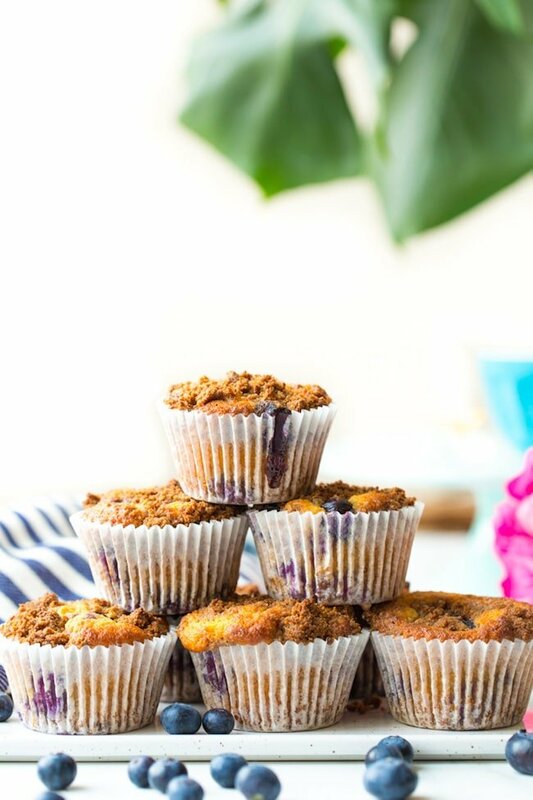 If you’re looking for an egg free blueberry muffin I recommend trying these paleo + vegan blueberry muffins instead. They don’t have a crumb topping but you can always add the crumb from this recipe to that one. It is an almond flour based recipe though so if you’re avoiding nuts it might not be the best option. I also have this egg free coconut flour cake (nut free) that you might enjoy – but I have not tested it with added blueberries. I do think you could add blueberries to it but I’m not positive how much of a difference the extra moisture from the berries will make on the overall recipe with personally testing it myself. Do I have to make the crumb topping? Nope! While I’m a total sucker for anything with a streusel topping you can absolutely leave it out here to cut back on ingredients, sugar, effort. 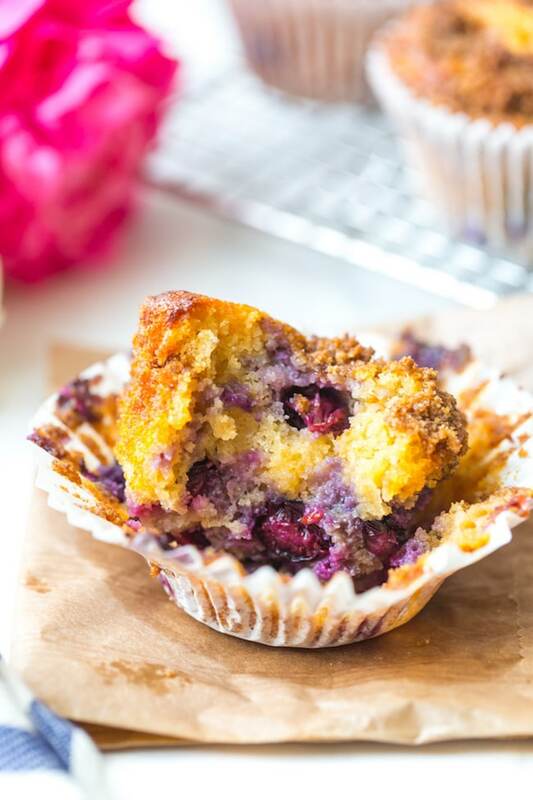 Don’t forget to #asaucykitchen on instagram if you try these paleo blueberry muffins! We love seeing what you make! You can also post your pictures to my facebook page! Preheat oven to 400°F/200°C and grease or line a 12 cup muffin tin with paper liners. You'll only need 9 cup greased/lined. Reduce the oven temperature to oven to 350°F/180°C. Beat the eggs in a medium sized bowl. Add the vanilla, the honey (or maple syrup) and oil to the eggs. Mix thoroughly. Pour the batter evenly into each muffin cup about 3/4 of the way full. Wipe down the bowl you used to make the batter and add the the flours, coconut sugar and cinnamon for the topping. Once combined add in the melted coconut oil. Mix into a crumbly mixture. Sprinkle the crumb mixture over the top of the muffins and gently press the crumb into the top of the batter. Can I make these egg free? I don't recommend using an egg free substitutes with this recipe. 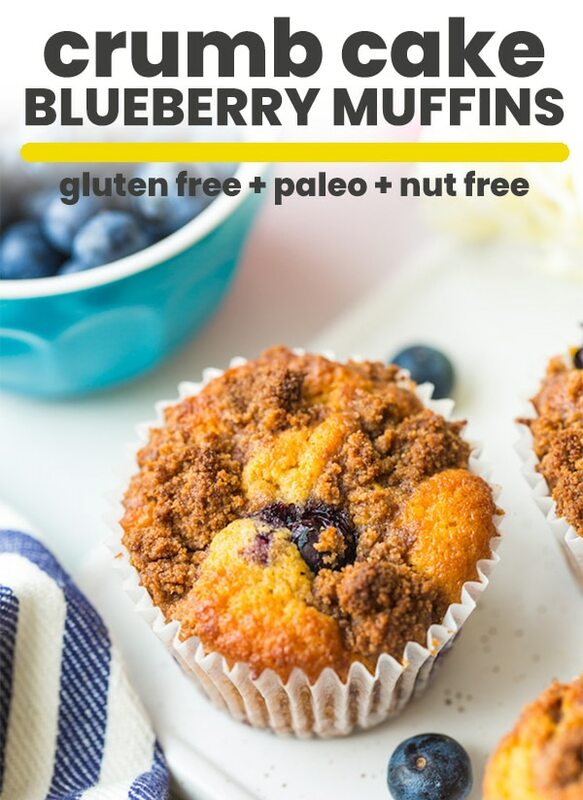 If you're looking for an egg free blueberry muffin I recommend trying these paleo + vegan blueberry muffins instead. They don't have a crumb topping but you can always add the crumb from this recipe to that one. It is an almond flour based recipe though so if you're avoiding nuts it might not be the best option. I also have this egg free coconut flour cake (nut free) that you might enjoy - but I have not tested it with added blueberries. I do think you could add blueberries to it but I'm not positive how much of a difference the extra moisture from the berries will make on the overall recipe with personally testing it myself. You can use arrowroot or almond flour in place of the tapioca flour. I don't have any substations for the coconut flour however this blueberry muffins recipe doesn't use coconut flour.